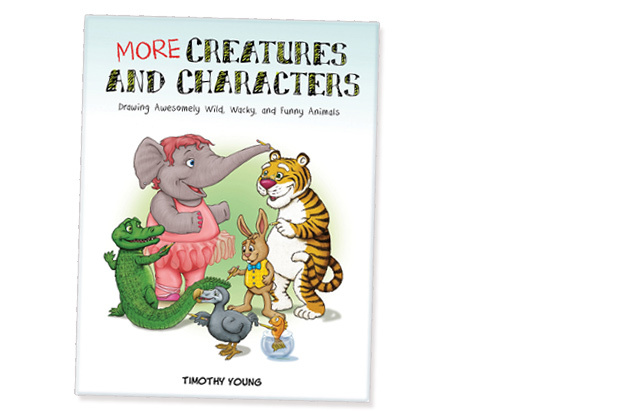 More Creatures and Characters: Drawing Awesomely Wild, Wacky, and Funny Animals is published by Schiffer Publishing. Professional artist and animator Timothy Young once again shows kids how to unleash their imagination on the page. Using pencil or ink, learn how to draw all kinds of fun animals, from silly sharks to dancing elephants. With dozens of process drawings as examples, this children's book illustrator demonstrates creative techniques to show children not just how to draw, but how to be creative. Sketch Poses: Draw your own Creatures and Characters with starter sketch pose pages you can download and print.